We think he is somewhere in the White House, but we cannot find him. He was last seen wearing his robe, watching television in the presidential sitting room, flipping through news channels, pausing occasionally upon seeing his likeness. Many of us are still acclimating to the spaciousness of this place, its nooks and crannies. It is easy to get lost. But lost is not the same as missing. The president has been lost before, like a set of car keys. Some of us have nicknamed him Old Car Keys, for the amount of times he’s been lost. But he has never been lost for this long; therefore it feels as if the president has crossed a semantic barrier––into missing. Less lost like car keys, and more missing like a child on a milk carton. Sometimes we are lost, figuratively speaking. We are lost without a captain to steer this great ship of state. It is possible the president is on a landing somewhere in the White House. There are many landings here. There are people who would put the president on a landing for various reasons we are not ready to discuss without an attorney present. Few of us have seen the president. In the flesh, that is. We have seen him on television. We have heard the television, and sometimes the president’s voice, blaring through the sitting room door. Now we pass the sitting room and hear no sound, see no blue light staining the carpet beneath the door’s crack. The carpet is thick and immaculate. We wander the halls looking for the president and cannot hear our own footsteps. We barely hear our own breathing. It takes some getting used to. There are many doors but few exits. The bookshelves are dustless and empty. We sleep in a windowless room lined with bunks and portraits of the president. The attorneys sleep in a similar room next-door. It is an honor to serve this nation, to live in these rooms, somewhere deep in the hull of this great ship of state. If you must know, we believe the president is stuck on a landing. We believe he is stuck on a landing, staring down a flight of stairs. We believe he is stuck on a landing, staring down a flight of stairs, which he is afraid to descend. We believe he is stuck on a landing, staring down a flight of stairs, which he is afraid to descend, because there is something wrong with him. Please keep our names off the record. We have come to believe the president is not missing or lost; rather, he is absent. Still we wander the hallways, longing for orders. Receive orders, follow them. Duty drives us to find the president and right this badly listing ship of state, though fewer and fewer of us believe these tasks are inherently related. One day we are looking for the president and the next we are told the president is not missing. The president is not lost. The president is not absent; rather, he is an absence. We are relieved. For months we have thought of him as a ghost whose absence haunts the hallways like our silent footfall. Still we scour the suffocating hallways for him. Though he lacks form and substance, we long for a source of order, orders. A ship cannot sail captainless, we think. It is hard to think. We scour the suffocating hallways. Mutinous talk in the hull: the president is not an absence, we are convinced. He is a gas. An invisible, odorless gas, to be precise. We have reason to believe the gas emanates from a landing in the White House. For too long we have wandered the halls, breathing it in. What is “ship”? What is “nation”? What is “order”? What is “we?” What is “President”? Noun. Primary definition: the elected head of a nation. Secondary definition: An incorporeal malevolent consciousness emanating from a landing in the White House. Side effects include various distresses: emotional, intestinal, existential. Tertiary definition: A person who presides. But there is no one to preside. 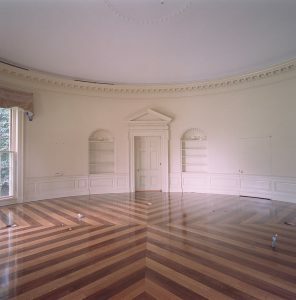 There is no one to president. There is no president. We dream of it, asleep in the hull: the moment we’re pulled from our bunks and led down an endless hallway, through a door and onto the deck, where at last we meet the starless sky. When we’re ordered to jump, we’ll jump willingly and hit the water with a deafening splash. We’ll swim until we clutch marshy earth, marooned amid factories scattered like tombstones across the landscape of our nation. We’ll watch the ship of state sail away, leaking the gas that is our president who is responsible for our collective psychosis. These are the facts. Take them now and leave quickly. Quickly. It’s too late for us.